Discuss the properties of glass and quartz. Glass is a non-crystalline, often brittle, transparent solid material made of silica (SiO2) and other minor additives. Glass has the ability to refract, reflect, and transmit light according to the principles of geometrical optics. Color in glass may be obtained by adding electrically charged ions that are homogeneously distributed, or by precipitating finely dispersed particles. Quartz is an abundant mineral made up of a continuous framework of SiO4 tetrahedra. Quartz crystals have piezoelectric properties: they develop an electric potential with the application of mechanical stress. Today, a crystal oscillator is a common piezoelectric use for quartz. Pure quartz is colorless and transparent or translucent. Microcrystal varieties are mostly opaque, while macrocrystals tend to be transparent. piezoelectricityThe ability of certain crystals to generate a voltage in response to applied mechanical stress. quartzThe most abundant mineral on the earth’s surface. Its chemical composition is silicon dioxide, SiO2. It occurs in a variety of forms, both crystalline and amorphous. It is found in every environment. glassA solid, transparent substance made by melting sand with a mixture of soda, potash, and lime. Glass is an amorphous (non-crystalline) solid material. Glasses are typically brittle and optically transparent. The most familiar type of glass, used for centuries in windows and drinking vessels, is soda-lime glass, composed of about 75% silica (SiO2) with the addition of sodium oxide (Na2O) from soda ash, lime (CaO), and several minor additives. 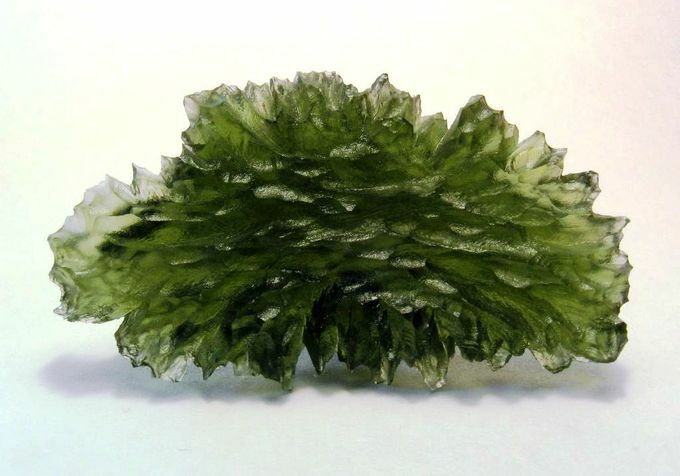 Natural GlassMoldavite, a natural glass formed by meteorite impact, from Besednice, Bohemia. Glass is in widespread use largely due to the production of glass compositions that are transparent to visible wavelengths of light. In contrast, polycrystalline materials do not in general transmit visible light. The individual crystallites may be transparent, but their facets (grain boundaries) reflect or scatter light, resulting in diffuse reflection. Glass does not contain the internal subdivisions associated with grain boundaries in polycrystals, so it does not scatter light in the same manner as a polycrystalline material. The surface of a glass is often smooth—during glass formation, the molecules of the supercooled liquid are not forced to dispose in rigid crystal geometries. The molecules can follow surface tension, which imposes a microscopically smooth surface. These properties, which give glass its clearness, can be retained even if glass is partially light-absorbing or colored. Glass has the ability to refract, reflect, and transmit light according to the principles of geometrical optics. Common glass has a refractive index of 1.5. According to the Fresnel equations, the reflectivity (the amount of light that gets reflected off the air-glass interface) of a sheet of glass is about 4% per surface (at normal incidence in air). This means the amount of light that gets transmitted through a glass surface (the transmissivity) is 96%. The transmissivity of a glass element with two surfaces is about 92%. Glass also finds application in optoelectronics for light-transmitting optical fibers. Color in glass may be obtained by adding electrically charged ions that are homogeneously distributed, or by precipitating finely dispersed particles (such as in photochromic glasses). Ordinary soda-lime glass appears colorless to the naked eye when it is thin, although iron (II) oxide (FeO) impurities of up to 0.1 % by weight produce a green tint. This is seen in thick pieces or with the aid of scientific instruments. Manganese dioxide can be added in small amounts to remove the green tint given by iron(II) oxide. FeO and Cr2O3 additions may be used for the production of green bottles. Sulfur, together with carbon and iron salts, is used to form iron polysulfides and produce amber glass ranging from yellowish to almost black. A glass melt can also acquire an amber color from a reducing combustion atmosphere. When used in art glass or studio glass, glass is colored using closely guarded recipes that involve specific combinations of metal oxides, melting temperatures, and ‘cook’ times. Most colored glass used in the art market is manufactured in volume by vendors, although there are some glass makers with the ability to make their own color from raw materials. Quartz is an abundant mineral in the Earth’s continental crust. 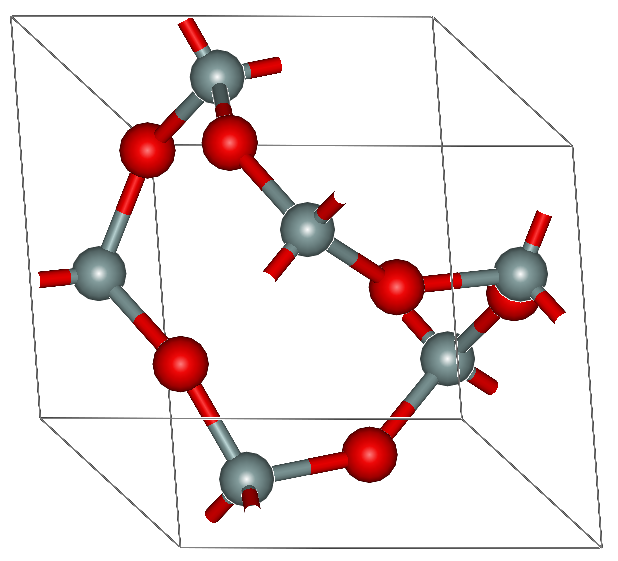 It is made up of a continuous framework of SiO4 silicon–oxygen tetrahedra. Each oxygen atom is shared between two tetrahedra, giving an overall formula of SiO2. There are many different varieties of quartz, several of which are semi-precious gemstones. QuartzThis diagram shows the crystal structure of quartz. Silicon atoms are grey, and oxygen atoms are red. Owing to its abundance and high thermal and chemical stability, quartz is widely used in many large-scale applications—abrasives, foundry materials, ceramics, and cements. Quartz crystals have piezoelectric properties. Piezoelectricity is the ability to develop an electric potential upon the application of mechanical stress. An early use of this property of quartz crystals was in phonograph pickups, where the mechanical movement of the stylus in the groove generates a proportional electrical voltage by creating stress within a crystal. Today, a crystal oscillator is a common piezoelectric use for quartz: the vibration frequency of the crystal is used to generate an electrical signal of very precise frequency. This is employed in many modern electronic devices (wristwatches, clocks, radios, computers, cellphones) to keep track of time or provide a stable clock signal for digital circuits. Pure quartz, traditionally called rock crystal (sometimes called clear quartz), is colorless and transparent or translucent. 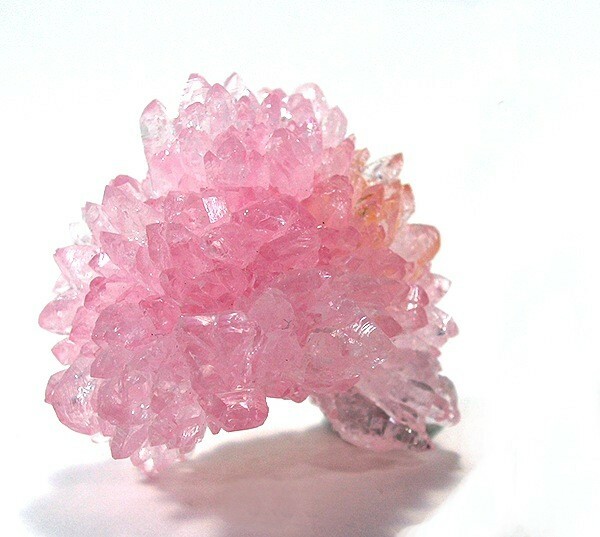 Common colored varieties include citrine, rose quartz , amethyst, smoky quartz, and milky quartz. Rose Quartz CrystalRose quartz crystals, Minas Gerais. The cryptocrystalline (crystals barely visible under microscope) varieties are either translucent or mostly opaque, while the transparent varieties tend to be macrocrystalline (large crystals identified by sight). Chalcedony is a cryptocrystalline form of silica consisting of fine intergrowths of quartz and its monoclinic polymorph, moganite. Other opaque gemstone varieties of quartz—or mixed rocks including quartz—often include contrasting bands or patterns of color. These include agate, onyx, carnelian, and jasper.